STEM Strikes the War Machine expresses its solidarity with the incarcerated workers on strike. We recognize that it is the same addiction to control which motivates elites to put people in cages as well as drop bombs on foreign countries. 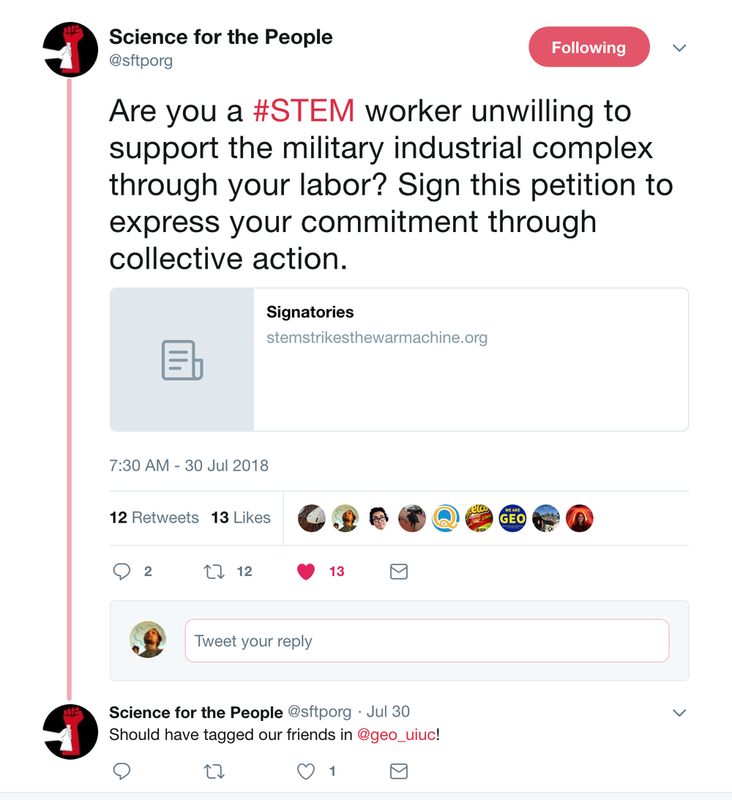 Science for the People tweets their support for STEM Strikes the War Machine. Science for the People is an organization dedicated to making science and tech a force for good in the world. Not only do they organize scientists to withhold labor from terrible institutions like militaries and ICE (Immigration and Customs Enforcement), but they also work to root out sexism and racism within our own ranks. STEM Strikes the War Machine gives its full support to Science for the People. 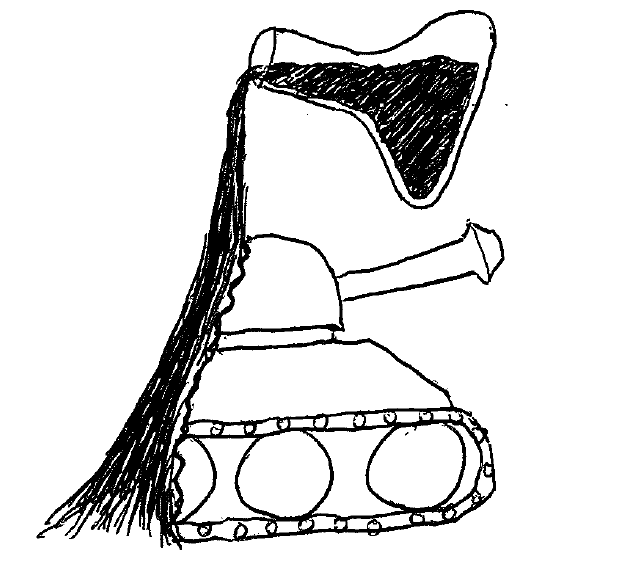 The GEO releases a statement of solidarity with STEM Strikes the War Machine. The Graduate Employees Organization (GEO) is the union representing teaching assistants and graduate assistants at the University of Illinois at Urbana-Champaign. STEM Strikes the War Machine congratulates the GEO on their successful 2018 strike which secured graduate employees a fair contract. Labor movements are an essential part of achieving an equitable world. The founder of STEM Strikes the War Machine goes on the Melon Heart podcast to discuss the campaign, revolution, Standing Rock, sadness, and the Harold Koh protest. 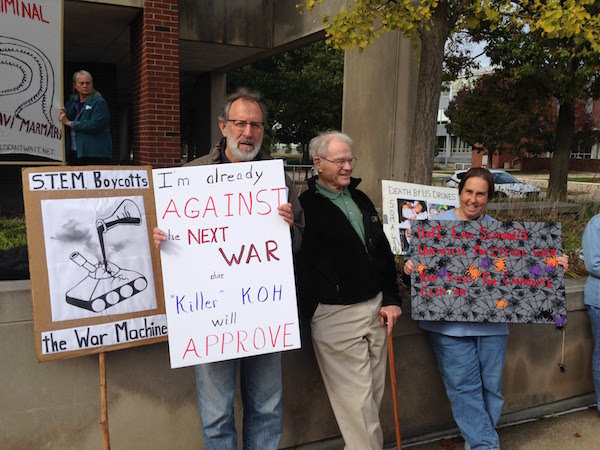 STEM Strikes the War Machine members and allies interrupt a Northrop Grumman recruitment session at the University of Illinois. On this day the University of Illinois Law School welcomes Harold Koh, the legal architect of the drone assassination program, to give a lecture. 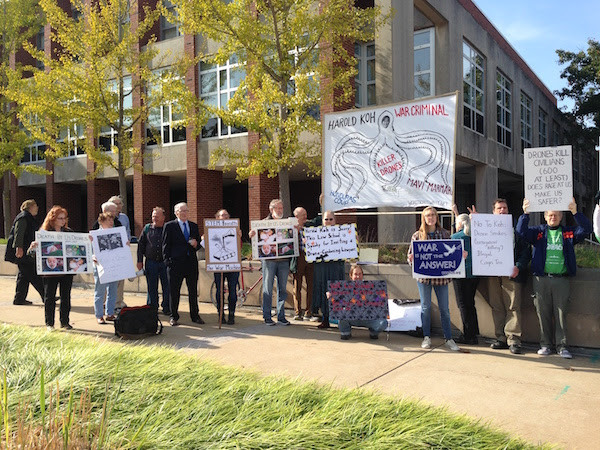 STEM Strikes the War Machine members and allies join together to protest him. Links to media coverage here, here, and here. Participating organizations include STEM Strikes the War Machine, AWARE (Anti-War Anti-Racism Effort), World Can't Wait Chicago, Neighbors for Peace, World Labor Hour, and Central Illinois Prairie Greens. The founder of the campaign goes on "AWARE on the Air" on public-access television to spread the word and play the campaign theme song. The campaign is founded! In one day, a facebook page, a (now-closed) change.org petition, and a primitive logo are put online. 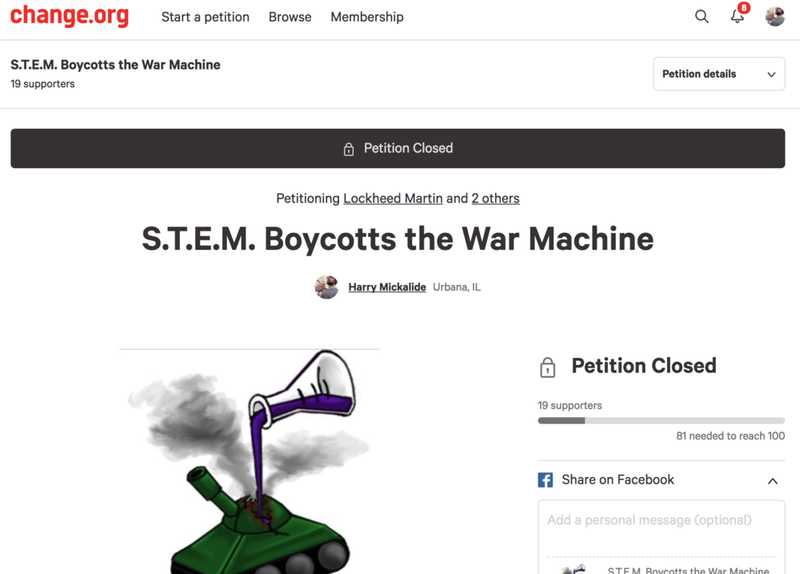 The campaign was originally called "STEM Boycotts the War Machine".